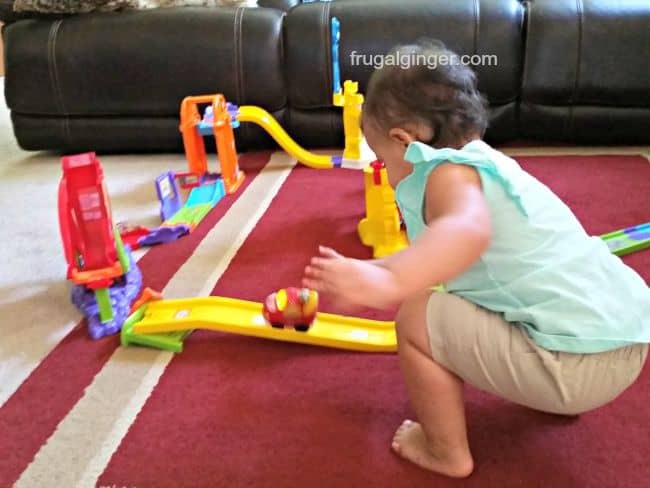 This is a great interactive toy that is perfect for kids ages 1-5. 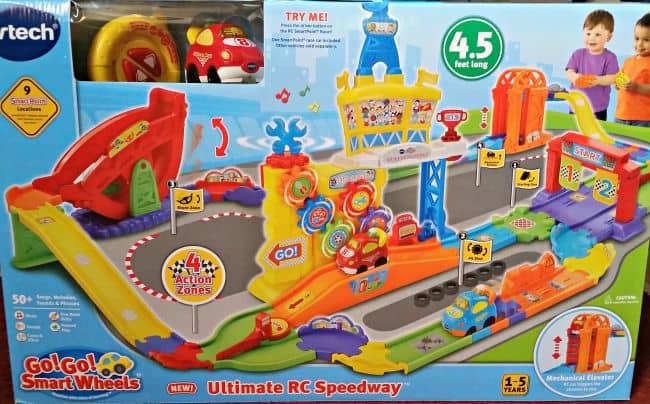 It includes 4.5 feet of colorful racetrack, a car that lights up and makes sounds, and a steering wheel-shaped remote control. The remote is simple, it just has a forward and backward button and your child can race the car around the track. I like that you can configure the track anyway you want. It includes an elevator, stunt ramp, and pit stop that has gears that move! The pit stop is my daughter’s favorite part. 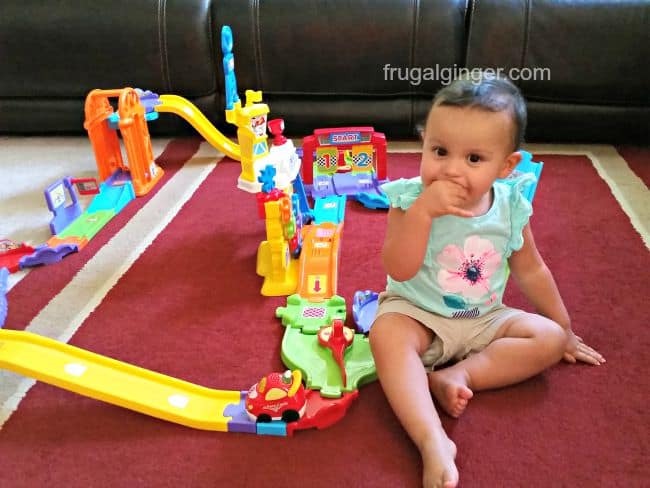 My little one is 20 months old and I think it might be something that she will like more in a few months. She doesn’t really understand that if she pushes the remote, the car moves. The track does take up a lot of room, so you need a large space to set up and a big bin or box to store all of the parts. Once you put some of the parts together, they don’t come apart, so it makes it a little difficult finding a place to store everything so that it doesn’t get lost. There are also a lot of stickers that have to be put on the track. I now understand why my Mom still talks about putting all of the stickers on my Barbie dream house, it is so frustrating! Once all of the stickers were on and the track was put together, my daughter loved watching the car go around the track. The car lights up and sings fun songs and makes other car noises. She likes running around the track with the car while her Dad does the remote. I honestly don’t know who likes playing with it more, her or her Dad! Overall, the Go! Go! Smart Wheels Ultimate RC Speedway is very fun and it is a toy that will last her a few years. 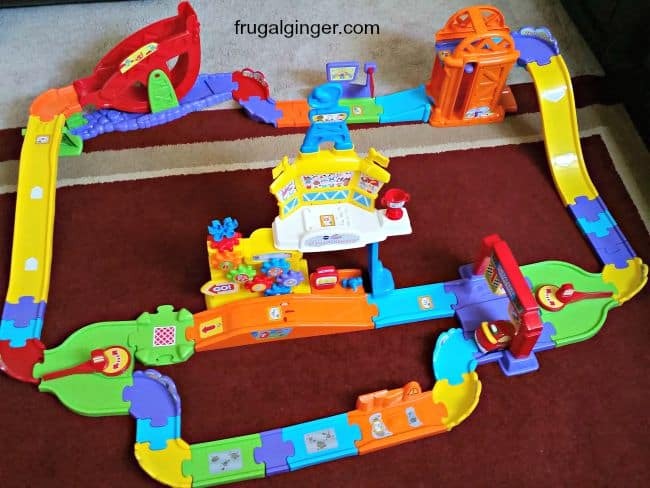 I like the fact that this racetrack can be connected to the other VTech Go! Go! Smart Wheels collections. You can also purchase another car and race with your friends. I like that this toy gets kids up and involved with constructing the set. It is really putting their minds to work. VTech is being kind enough to offer one of my readers their very own Go! Go! Smart Wheels Ultimate RC Speedway ( retail value $59.99)! This is open to US residents only. This would make a great Christmas gift for the child in your life. To enter, just fill out the Rafflecopter form below. If I won, this prize would be for my nephew. i would give this to my daughter !! This prize would be for my son. My 21 month old would love to add this to his vtech go go smart wheels collection! For my little nephew he would love to play with it.